Here’s some more material about my great-great-grandfather James Buskin Frail (and his namesake son, my great grandfather) – it’s the 1873 Gravesend newspaper account of the inquest into his nephew’s death. The Larnax story hinges on whether or not he had a ‘riding light’ or anchor light lit when his ship was rammed. Do you believe him? Probably something like this (currently on eBay) – although it is described as globular. 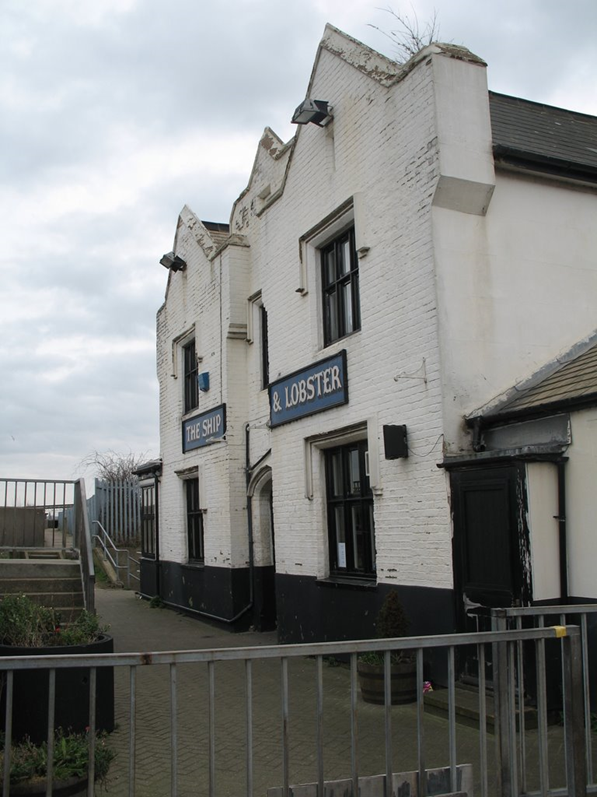 On Friday evening, the 4th inst., an inquest was opened at The Ship and Lobster, before J. Hills, Esq., coroner, on view of a body recently picked up near that place, which had been identified as that of the young man John Guidott, who was drowned some time gone in Gravesend Reach, through a collision between the Newcastle screw steamer C.M. Palmer and the barque Larnax. As stated in our columns at the time of the occurrence, the Larnax, which was bound for the Mauritius under Captain J.B. Frail, was lying at anchor about a mile and a half below Gravesend on the night of the 10th February, when the C.M. Palmer was seen steering a course in the direction of the barque, and it was said she was hailed. The steamer came on, and struck the Larnax, which filled and very soon went down. Most of the crew managed to get on board the steamer. The deceased, who was Captain Frail’s nephew, was asked by him to take charge of his child, a little girl aged three years. The young man afterwards tried to get on board the steamer with the child, but in so doing, he fell in the water and both he and the child were drowned. The steward of the barque was also drowned. The steamer was much damaged, but she brought up, and sent off a boat, by which means Captain Frail, his wife, and some others, who had taken refuge in the rigging of the barque, were saved. It was stated on the part of the barque that she had her proper riding (anchor) light up, but on the other hand this was denied. The only evidence taken on Friday was that of the father and mother of the deceased, who identified the body as that of their son. The enquiry was adjourned till Wednesday at noon, that several other persons who witnessed the accident might be examined. The inquest was resumed on Wednesday, at the Ship and Lobster, before the same coroner and jury. Mr. Moss, solicitor, of No. 38, Gracechurch-street, London, attended on behalf of the relatives of the deceased; Mr. Pritchard, of the firm Pritchard and Son, of Doctors’ Commons, on behalf of the owners of the Larnax; and Mr. Clarkson, barrister, instructed by Messrs. Geleatly, Son, and Warton, of Lombard-street, City, on behalf of the General Steam Navigation Company, to whom the C.M. Palmer belongs. George Reeves, fisherman, of Gravesend, deposed that he was out in his boat on Thursday morning, near the Ship and Lobster, when he saw the body of the deceased floating in the water. Brought it ashore, and afterwards gave information to the police. Did not know anything about the identity of the body, nor how the deceased came by his death. James Buskin Frail, captain of the barque Larnax, deposed that he was uncle to the deceased. Had seen the body, and had no doubt as to its identity. The Larnax left London on the morning of 19th February on a voyage to the Mauritius, witness being in command. The deceased accompanied witness as a visitor as far as Gravesend. They reached Gravesend about half past nine o’clock that morning, and came to anchor in the lower part of Gravesend Reach, intending to stay there till the following morning. All went well until about half-past nine in the evening. About that time the boy on deck called out that a steamer was coming into them. Witness was below at the time, but at once went on deck, but before he could reach the deck the steamer struck the barque with her stem on the starboard bow. Witness’s wife followed him on deck, and the deceased took witness’s little girl from him, saying he would take care of her, and witness could look after his wife. The deceased went forward with the child to go on board the steamer. Before witness could get forward with his wife the barque parted and he saw no more of the deceased or of the child. Witness hailed the steamer as she passed astern, and asked if John (meaning the deceased) was on board. Someone answered “Yes.” Told them to send a boat as soon as they could, as the vessel was sinking and then took his wife up into the mizzen rigging. After the barque sank a boat came from the steamer, and witness sent his wife, one man and a boy to the steamer. Another boat afterwards came and took off witness, the mate and the pilot, to the steamer. When they got on board, witness found that the deceased and the child were not on board, and it did not appear that either of them had been on board at all. Witness believed it was the carpenter of the “Larnax” that called out “yes” when witness asked whether they were on board, but could not account for that answer being given. Did not know whether anyone saw the deceased fall overboard. Deceased had with him when he left London, a green greatcoat, but this had since been found aboard the barque. The steamer was the C.M.Palmer, of Newcastle, of 628 tons burden. The watch was set on board at 8 o’clock in the evening; it consisted of a man and a boy. There was a bright light hanging in the starboard fore-rigging. It was an ebb tide and the barque’s head was up the river. Witness was on deck about twenty or twenty-five minutes before the collision took place. The light was there then and the man on the watch was walking underneath it. It was a dark, hazy night. The barque lay about three-quarters of a cable’s length from the upper powder-buoy, and out of the ordinary course of vessels coming down the river. On getting on board the steamer, witness did not see anybody in charge. Enquired for the captain, and was asked to walk below. Went down into the cabin and there found the crew of the Larnax. Remained ten minutes or a quarter of an hour in the cabin before seeing the captain. Was then introduced to him in a side cabin. The captain said it was a bad job for him, and witness replied that it was worse for him with regard to the loss of life. After a little conversation with the captain about those who were drowned, witness went to his wife, who was in a fit, and saw no more of the captain till the morning. Stayed on board the steamer all night. She was anchored with her stern down the river. In the morning witness saw him again, but did not think it was in his place to ask him anything about the collision, and nothing was said about it. Left the steamer about seven o’clock in the morning, and witness’s wife, with the crew, left the same morning. The stem of the steamer was broken in two place, showing that the collision had been very violent. Heard nothing about the approach of the steamer till the boy on board the Larnax called out. When witness was on deck, shortly before the collision, he did not see the boy. At that time a light could have been seen more than half-a-mile off. At the moment of the collision, there was very little difference in the state of the weather. Did not know how fast the steamer was going. – By Mr. Moss: The pilot in charge of the barque anchored her. After the collision, witness saw the light still burning. After the collision, witness saw the light still burning, and remarked to the pilot and the mate that the steamer had not struck there for want of a light. It was a proper light – the usual globular light – and might have been seen half-a-mile off. When the captain of the steamer spoke about it being a bad job, he said nothing about the light. At the time of that conversation, witness knew his child and nephew were lost. The conversation was cut short in consequence of witness’s wife being ill from the shock. The place where the barque was anchored was not a proper place for a steamer going down the river. Other vessels were lying at anchor, close by the barque. – By Mr. Clarkson: At the time of the conversation with the captain of the steamer, witness was naturally distressed in his mind on account of the loss of his nephew and daughter. The other captain knew of the loss of witness’s relatives. Witness’s wife was in a fit at this time, making a noise which they could hear. Would swear that the captain of the steamer said “It’s a bad job for me.” Another vessel called the Boreas was anchored something short a quarter of a mile from the Larnax on the starboard quarter. Another vessel was anchored 60 or 70 fathoms off, on the port bow, and another nearly right ahead, about a quarter of a mile off. The boy who had the watch on board was named John Thomas, and the man John Ward. Knew the boy had said he took the riding light down, and put it up again just before the collision, but had never heard the boy say so himself. Was in the Admiralty court at the enquiry lately held, but did not remember hearing him asked whether he told a man named Hoar that he and another had lowered the riding light to clean it, just before the collision, nor the answer the boy gave. Heard the boy in the Admiralty Court say he had told the waterman that the light was down a quarter or half an hour before the collision to wipe the glass. James Buskin Frail, jun., said he was the son of Capt. Frail, and was on board the Larnax on the 19th February – not as part of the crew but as a visitor. Was on deck about seven minutes before the collision, and then saw the light in the fore rigging burning brightly. Did not notice the watch on deck. Did not see any steamer approaching. Very soon afterwards, having gone below, heard the boy Thomas call out that a steamer was coming into them, and ran on deck again. Went forward, and found the steamer in collision with the barque, and got on board the steamer. Felt the collision just before this. Never saw his cousin nor his little sister. After getting on board the steamer, witness saw that the light was still burning in the rigging of the barque. Witness heard his father ask if deceased was on board the steamer, and heard someone whom he believed to be the carpenter say, “We don’t know yet.” Believed someone else shouted “Yes.” The collision took place before the witness got on deck, while he was on the companion ladder. Thomas James Cook of Great Yarmouth, boatswain of the screw steamer Boreas, said that ship was lying at anchor in Gravesend Reach, on the night of the 19th February, about half a mile from the Larnax. Was on deck from nine o’clock on that evening, on the look-out, in company with another man. It was a very dark night, and a little hazy. The last time the witness noticed the clock, it was about ten minutes past nine. Saw a light, belonging to some vessel, about a quarter of a mile ahead. It was impossible to see a vessel at that distance. Witness was standing near the windlass when he heard a noise, and went on in the forecastle, and then saw the lights of a steamer near the light he had previously seen. This would be about half-past nine. Between the time when witness noticed the time and the time of hearing the noise, he saw the light before mentioned two or three times. Could not see the light while standing against the windlass, and therefore had not seen it for a period of about ten minutes before hearing the noise, and could not tell whether or not it had been taken down in the meantime. After hearing the noise first, witness heard cries for help, and a boat was then lowered from the Boreas, and sent in the direction of the light he had seen. Witness did not go in the boat. Samuel Press, able seaman on board the Boreas, said he was on board that ship about nine o’clock on the night of the 19th of February, and saw a riding light about a quarter of a mile ahead, a little on the port bow. It was very dark. Was sometimes on the forecastle and sometimes on the main deck. About a quarter or twenty minutes past nine, as near as the witness could tell, he heard a crushing noise, as if a collision had taken place, followed by cries for help. About ten minutes before this, witness was on the forecastle, and then saw the riding light. After hearing the cries for help, witness went with it to where the riding light had been seen, and then found it was the barque Larnax. The steamer was near the barque, which was sinking. There were three people on the quarter deck of the Larnax, which was still above water. The riding light was still burning in the rigging. In witness’s opinion, both the Boreas and the Larnax were anchored in places where they would be out of the way of the ordinary traffic of the river, and the steamer’s course ought to have been much nearer the north shore. Matthew Conway, seaman, of Limehouse, deposed that on the 19th of February he was mate on board the Larnax. At a quarter to nine, witness went to bed, and at half-past nine, hearing the captain say another vessel was running into the barque, he turned out again, and went on deck. The collision took place before he could reach the deck. After the barque sank, witness was taken off by the steamer’s boat, and on getting on board the boat, saw that the riding light was still burning. John Ward, able seaman, of Greenock, deposed that he was on board the Larnax on the night in question, and was on the look-out, in company with the lad, John Thomas. The barque’s riding light was put up at sun-down. A little before nine o’clock the light was taken down, and the boy wiped the glass. Witness then took it from him and wiped it himself. It was then put up again and witness heard two bells strike on one of the ships lying near. The boy asked what that meant, and witness told him it meant nine o’clock. It took about a minute to take down the lamp, wipe it, and put it up again. 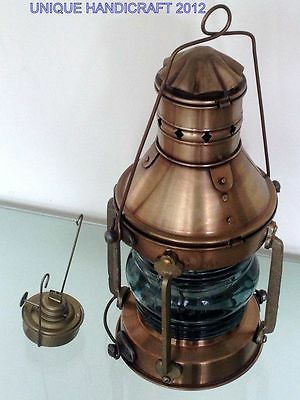 The lamp did not want trimming but only wiping, Witness saw the red light of the steamer when she was about two lengths from the barque. He hailed her, and she then struck the barque. The night was dark and the light could not be seen more than four or five lengths off. It was about twenty minutes after putting up the riding light again that witness saw the steamer’s light. Witness did not hoist the light, but carried it up himself; it burnt clearly both before and after that. Did not carry up the light after seeing the steamer. – By Mr. Clarkson: I did not see the steamer’s green light and therefore she must have been under a port helm. When I was examined in the Admiralty Court I said the lamp was down two or three minutes. I took the lamp to the galley to wipe the glass. When I took the light up again, John Thomas was walking about on the deck. I cannot be certain whether I said anything in the Admiralty Court about Thomas wiping the glass. It took about a minute and a half so far as I can tell, to take the lamp to the galley, about a minute or so to wipe it, and about a minute and a half to put it up again. I saw Thomas about once a week since the collision, but have never said anything to him about the light. Andrew Grant, Trinity House pilot, of Bow, London, deposed that he was in charge of the Larnax on the night in question, and brought her from London as far as Gravesend Reach, where she anchored, with her head up the river. Had been a pilot twenty-six years, and was aware that certain rules were laid down by the Thames Conservancy for the regulation of the navigation of the Thames. The place where the Larnax was anchored was about the best he could select considering that she had to take some powder on board. The steamer had as much right there as the Larnax, so long as she did not touch the Larnax. The riding light of the barque was put up about dusk, and it seemed to witness a proper riding light. Just before collision, witness was below, when the watch called to him, saying a vessel was getting foul of them. Went on deck, and saw a large steamer, which was afterwards found to be the C.M. Palmer, with her head to the southward, athwart the tide, and approaching the barque. In about two or three minutes, she struck her on the bluff of the starboard bow. Did not hail the steamer, but understood the watch to say they had hailed her. They did not hail her while witness was on deck. When he first saw her, she was only a short distance off – perhaps only a few fathoms. Had no doubt it was the intention of the captain of the steamer to bring her up; could not tell at what speed she was then going, but judging from the force of the blow, she must have had some way on her. If the Larnax had not been there, it would have been a proper place for the steamer to bring up. Was on deck about a quarter of an hour before the collision; the riding light was then burning properly. – By Mr. Clarkson: Considering the darkness of the night, witness considered it would have been prudent on the part of the captain of the steamer to bring up. The speed with which she struck the Larnax was her own speed and the force of the tide. Apart from the fact of the Larnax lying there the steamer would require some little way on her to come round with her head to the tide, and two knots’ headway, and the tide would account for the force of the blow. This concluded the evidence for the present sitting, and the inquest was then adjourned to Wednesday, the 14th of May, at noon.